The largest of the Fairmount Park Charms houses, Strawberry Mansion illustrates three distinct phases in American Architecture as well as the lives of two important and distinguished Philadelphians. The featured stories of this house span over three centuries and incorporate the life of the acclaimed colonial Judge William Lewis (1752-1819) to the national celebration of the Sesquicentennial of 1926 (celebrating America’s 150th anniversary.) Of course the story involves tales of lavish parties and strawberries. Become a history detective and decide for yourself which story about the house name is most accurate. Formerly known as “Summerville,” the center section of Strawberry Mansion was built in the Federal style around 1789 by renowned lawyer, judge and state legislator, William Lewis. During his lifetime, Lewis dominated the American legal field and took on countless high profile cases involving slavery, British debts, privateering, and the Aaron Burr treason case. He is credited for drafting the first law in the US abolishing slavery and was an advisor to both George Washington and Alexander Hamilton. Strawberry Mansion became part of Fairmount Park and was then soon rented out as a restaurant. During its restaurant years, Strawberry Mansion grew into such a popular institution that, by the turn of the century, the nearby neighborhood and newly erected bridge were named after it. It was used as a this restaurant and popular picnic spot into the 20th century until the Committee of 1926, a group of civic-minded women, took over as the administration of the building. Strawberry Mansion has extensive grounds and features a large collection of American and European decorative arts and antiques. 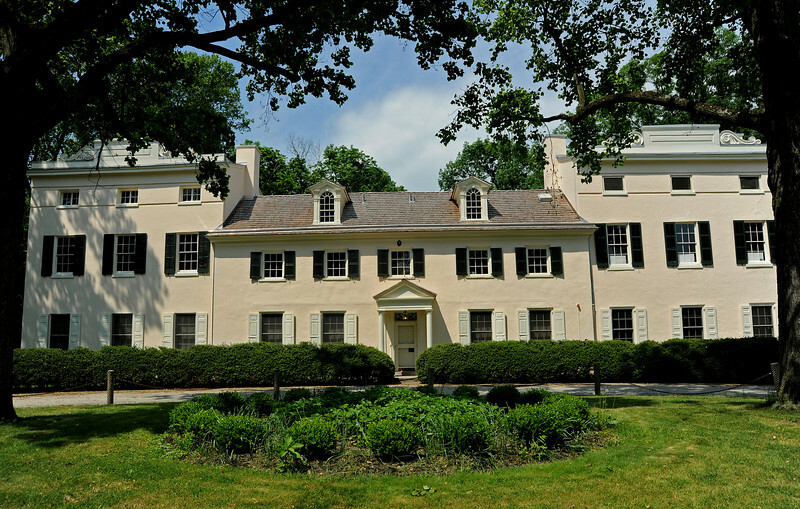 A large and impressive building, Strawberry Mansion is designed in a Federal style, based on a central hall plan; two-and-a-half stories high in its main section and made of stucco-faced stone, scored to imitate ashlar. With a width of five bays for the central section, it features a basically symmetrical façade, common for the time. Two dormers protrude from either side of the roof and fanlights illuminate the east and west entrances, and a small portico shelters the east. Two end chimneys, rising through the ridge of the roof, are partially incorporated into the wings. Greek Revival wings, added later, flank the central section and are set back slightly. Low-pitched gable roofs cover the additions and, on the east side, are decorated with parapets consisting of panels and massive scrolls.Strawberry Mansion features a large collection of notable American and European decorative arts, antiques and toys. By 1930, the home’s architecture evolved as the Colonial Revival movement rose to prominence. The renewed focus on colonial interests help restore Strawberry Mansion and other homes in Fairmount Park. The then Director of the Philadelphia Museum of Art, Mr. Fiske Kimball, was influential in advocating and promoting restoration of many of the Charms Park Houses. 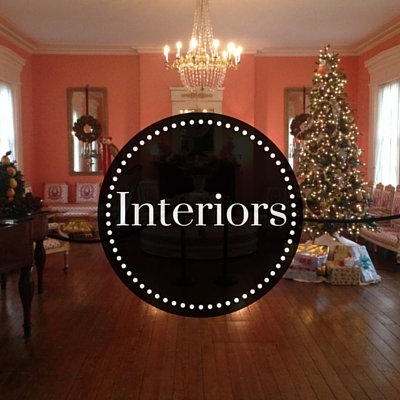 Strawberry mansion's interior contains elaborate Federal-style woodwork that is concentrated in the entrance hall. The Greek revival "ballroom" on the first floor of the south wing is also ornate. Two large floors are filled with an impressive array of furniture and decorative arts from different time periods, while the attic is full of antique toys and a doll collection. Families often find that young visitors can relate to the toy collections as a way to better understand the past. In addition, the home contains famous examples of Hemphill and Tucker porcelain on display. Situated in the East Park, Strawberry Mansion is on the steep cliffs above the Schuylkill River and is close to Woodford and Laurel Hill. The expansive grounds include a “secret garden” with benches created by the Committee of 1926 and is a lovely spot to pass a summer afternoon. Each of the Charms houses is represented individually in the logo. These key icons are based on the unique qualities of each home --- here the key is a delicate strawberry. Check out Historic Strawberry Mansion's website here. You can follow Historic Strawberry Mansion on Facebook here.